Ladislav Sutnar’s designs for porcelain tableware effortlessly combine functionality with modern design. Intended for everyday use, this mocha pot (the large pot on the left) and creamer were originally part of a 47-piece service that won a design competition in Sutnar’s native Czechoslovakia in the late 1920s. Designed for the Družstevní práce (or DP, Cooperative Work), these pieces were manufactured by Epaig Loket between 1928 and 1932. Greatly influenced by the visual language of modern art—and with a background in painting—Sutnar shows a sensitivity toward material, such as porcelain, in both his product design and graphic design (for which he is best known). 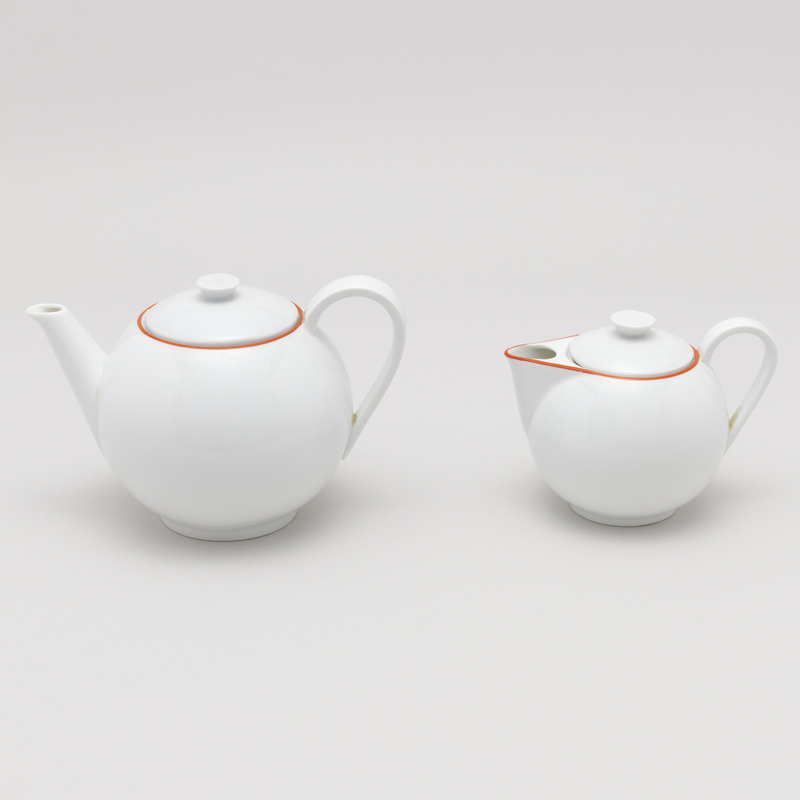 He recalls his porcelain designs in his 1961 book Visual Design in Action: Principles, Purposes: “Porcelain calls for delicate forms to match its smooth, white, translucent, light reflecting qualities. The design must fuse the utilitarian functions into forms which creatively express the properties of the material.” Here, materiality is of utmost importance, as Sutnar links porcelain’s physical lightness to its functionality, which exploits both its strength and durability. The globular forms of these pots echoes throughout the rest of this service, part of which can be seen in the collection of The Museum of Modern Art, as well as in other ceramics by Sutnar in Cooper Hewitt’s collection. Sutnar described the repetitive use of the sphere in its design as providing a “unique harmony to the set as a whole.” This concept of the “whole” was reiterated with his accompanying design for a white linen tablecloth, which is shown in the original promotional photographs for this design. Consequently, Sutnar’s white porcelain tableware, along with his design of the entire domestic tabletop, conveys his straightforward and holistic approach to design. This mocha pot is currently on view in The Jazz Age: American Style in the 1920s through August 20, 2017. Ladislav Sutnar, Reto Caduff, and Steven Heller, Ladislav Sutnar, Visual Design in Action: Principles, Purposes, (Zurich: Lars Müller Publishers, 2015), c/8.